The Rolls Royce Pegasus line is up and running! 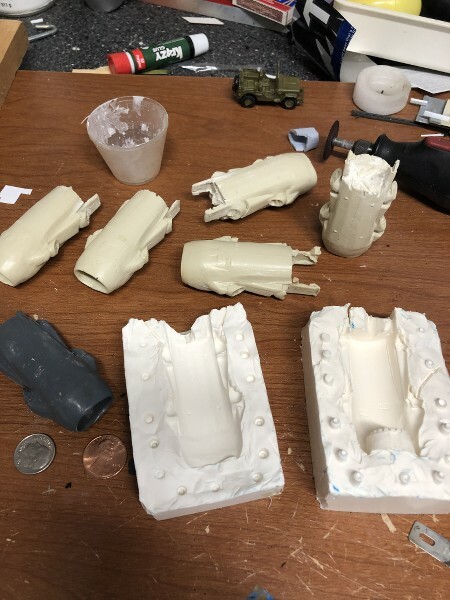 Popping engines out of the mold. Some clean up will be required. 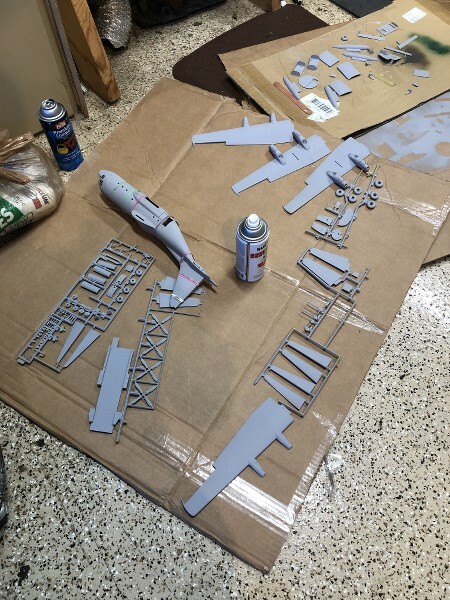 The compressor blades came through. One does wonder why only FIVE! Thanks everyone! first time I have molded a complex shape. Making the master for the rear of the nacelle. 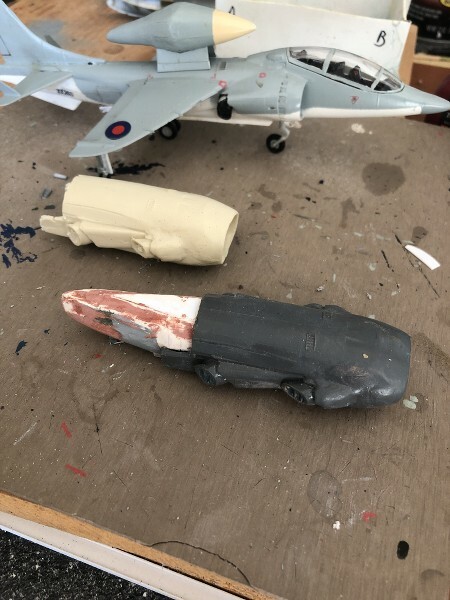 Was unsure how to best mount the engines, directly underneath the wing or more towards the front in place of the turboprops, but to maintain center of lift/center of thrust/center of gravity considerations to allow super STOL, a podded engine, with barely a pylon seems to work. Harrier GR3 providing the rear of the nacelle. Putty and bondo. Meanwhile, the early RAF tan had to go. Primer on. 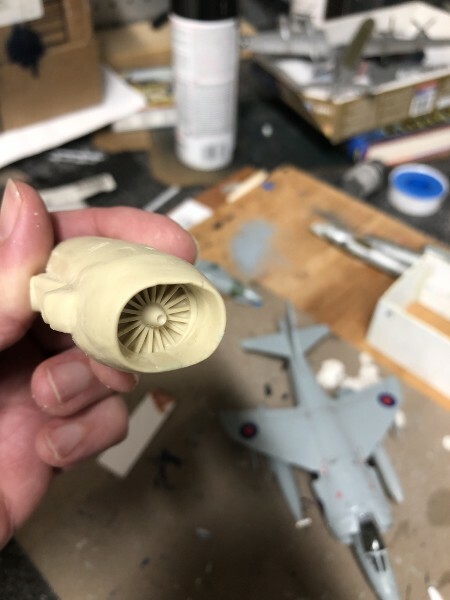 When I was working out where the engines would go on my STOVL Canberra, I figured that when the nozzles are swiveled downwards for vertical take-off, the center of the four nozzles* should be in line with the load cg on the aircraft. * the center being where two lines cross, one line running from front-right nozzle to rear-left, the other line running from front-left to rear-right. Wow. That's great work. I love the resin casting aspect of it. In my experience you've probably hit the sweet spot in terms of the size. 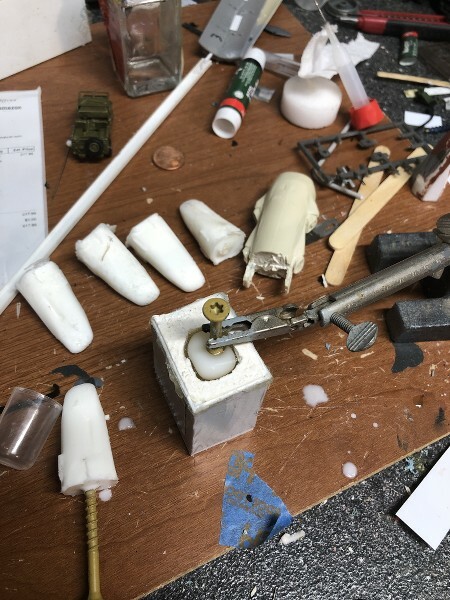 I've tried very small moulds and they're a real pain to work with, but something this size should work very well indeed. I'm loving where this is going. Do the "cold" (front) nozzles produce the same thrust as the "hot" (rear) ones? I reckon they must do, in lbs thrust anyway, 'cos the Harrier's nozzles are positioned an equal distance apart from the CG. I've read somewhere (can't remember where though) that they do on the Harrier. I might have asked someone who was in the know too --- but it worked out very well for my project because a lot of things suddenly started to fall in place technically with the build after I discovered that. Back at it, was out of town for a week and had to reorder a new batch of two part resin. New resin is white when cured. 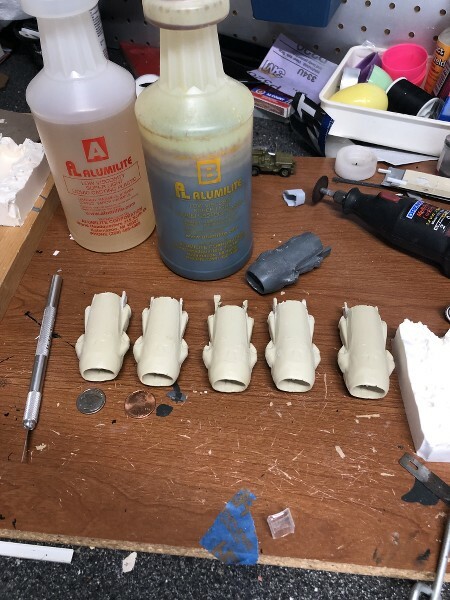 Made a mold for the aft part of the engine nacelles. 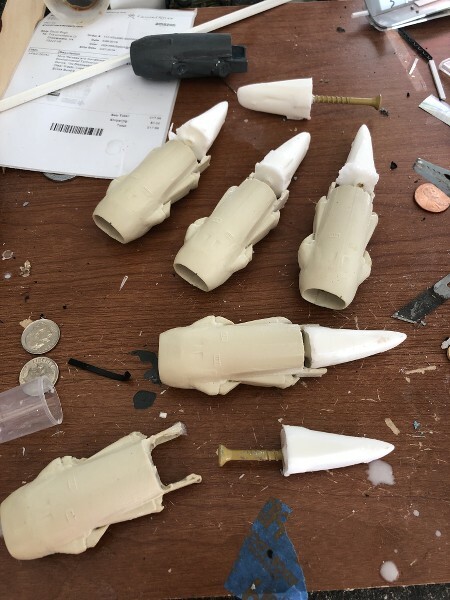 As the resin set put a small screw into the resin to help pull the nacelle out of the mold. Helped a lot. and had to reorder a new batch of two part resin. For some reason, getting re-supplies of Aluminite is very hard up here in Canada.